Homero Aridjis has always said that he was born twice. The first time was to his mother in April 1940 and the second time was as a poet, in January 1951. His life was distinctly cleaved in two by an accident. Before that fateful Saturday he was carefree and confident, the youngest of five brothers growing up in the small Mexican village of Contepec, Michoacán. After the accident - in which he nearly died on the operating table after shooting himself with a shotgun his brothers had left propped against the bedroom wall - he became a shy, introspective child who spent afternoons reading Homer and writing poems and stories at the dining room table instead of playing soccer with his classmates. After the accident his early childhood became like a locked garden. But in 1971, when his wife became pregnant with their first daughter, the memories found a way out. Visions from this elusive period started coming back to him in astonishingly vivid dreams, giving shape to what would become The Child Poet. Aridjis is joyously imaginative. The Child Poet has urgency but still takes its time, celebrating images and feelings and the strangeness of childhood. Readers will love being in the world he has created. Aridjis paints the pueblo of Cotepec -- the landscape, the campesinos, the Church, the legacy of the Mexican Revolution -- through the eyes of a sensitive child. 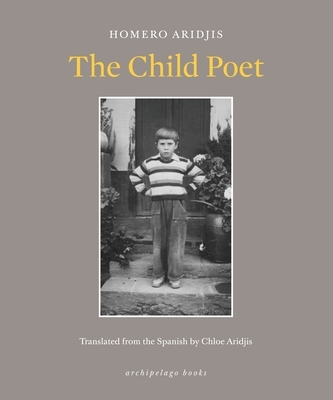 One of Latin America's foremost literary figures, Homero Aridjis was born in Contepec, Michoacan, Mexico. Many of his forty-five books of poetry and prose have been translated into fifteen languages, and his writing has been recognized with important literary prizes. Formerly Mexican Ambassador to Switzerland, The Netherlands, and UNESCO, during six years he was international president of PEN International and is now president emeritus. As founder (in 1985) and president of the Group of 100, an environmentalist association of writers, artists, and scientists, he has received awards from the United Nations, the Orion Society, Mikhail Gorbachev and Global Green USA and the Natural Resources Defense Council. Tiempo de ángeles/A Time of Angels, Eyes to See Otherwise, Solar Poems, and 1492 The Life and Times of Juan Cabezon of Castile are among his books available in English. Chloe Aridjis was born in New York and grew up in the Netherlands and Mexico City. After receiving a BA from Harvard, she went on to receive a PhD in nineteenth-century French poetry and magic shows at Oxford. Her 2009 novel Book of Clouds (Grove) was published in eight countries, and won the French Prix du Premier Roman Etranger.